Oppo R17 Pro going to be launched in India on December 7th, 2018. The Smartphone boosts with three rear cameras. And in-display, the world's first Corning Gorilla Glass 6. Oppo R17 Pro is expected to have an in-display fingerprint sensor. Oppo Smartphone Manufacturer- Tech Desk in China is going to launch its flagship smartphone Oppo R17 Pro in India.The company already launched this model in the Domestic market – China duringAugust 2018. The special feature of thissmartphone is that it has Super VOOCtechnology battery that supports fast charging. Apart from this, three camerasat the rear of the phone can be used by everyone to buy it. 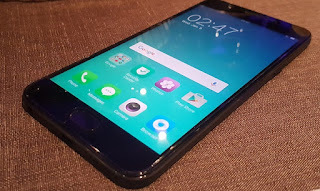 Oppo R17 Pro pricemay be estimated that it may in the range of Rs. 44,000 + since its price in Chinamarket is 4,299 Chinese Yuan (about44,000 rupees). The OppoR17 Pro smartphone features a water drop notch screen. It has a 6.4 inch (16.2CM) AMOLED display, which is 1080x2340 pixel resolution. The screen-to-body ratio is 91.5 percent. Also, Corning Gorilla Glass 6 has been given on the display which has not been given to any phone in the world till date. The Qualcomm Snapdragon 710 processor has been given in the Oppo R17 Pro phone. This phone works on the Android 8.1 ORIO operating system. The smartphone has 8 GB RAM and 128 GB inbuilt storage. The phone doesn’t have the MicroSD card option. It has a battery capacity of 3700 mAh, so we can expect day long worry-free use. The handset has an in-display fingerprint sensor like Oppo Find X.